Six years after he graduated from Saint Michael's College, Eddie DiDonato pulled an all-nighter. The bartender, who works at Leunig's Bistro & Cafe and Waterworks, was up until 4 a.m. Monday to prepare for a cocktail competition in Boston. After a few hours' sleep, he loaded his gear into his car, stopped at Tomgirl Juice Co. to pick up some wildflower-cashew milk, and drove to Boston to compete in the Most Imaginative Bartender contest. 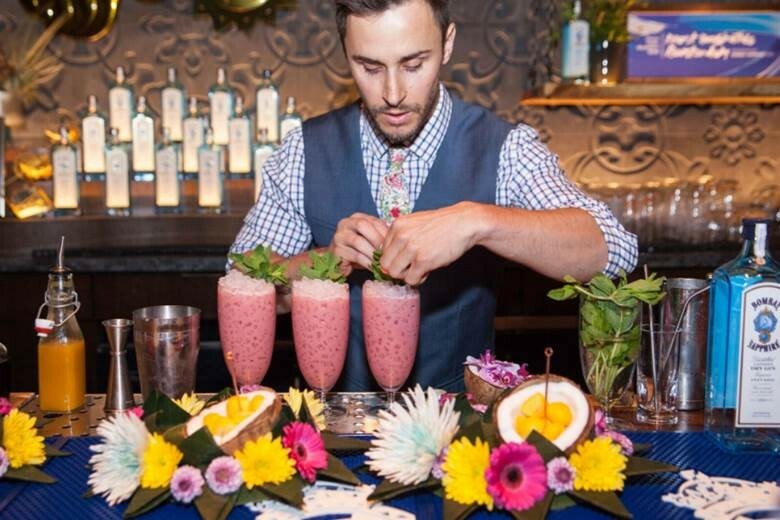 The annual event is presented by Bombay Sapphire gin, which is a required ingredient in the competing cocktails. The cashew milk — and gin — were key ingredients in DiDonato's drink, a cocktail he concocted called Tiger's Milk. With it, he bested a field of 10 bartenders from around the Northeast to win the regional contest. 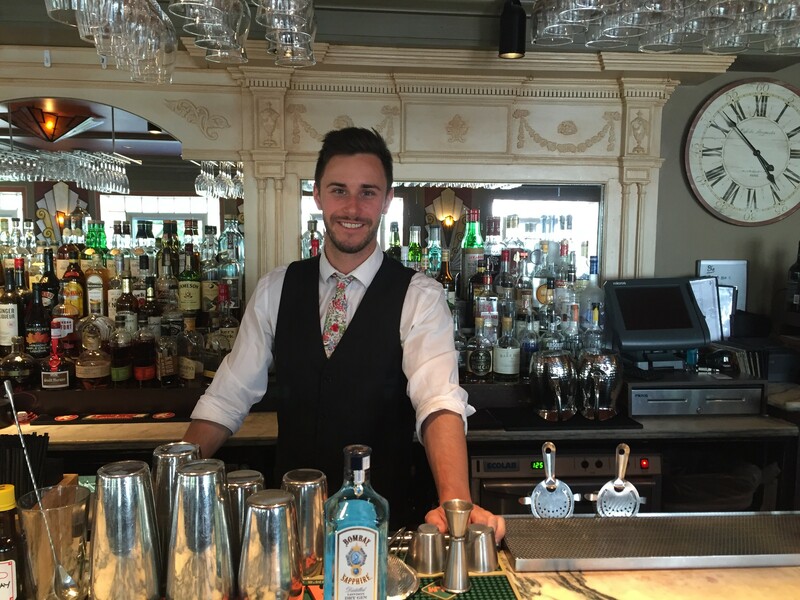 DiDonato will compete in the North American Most Imaginative Bartender (MIB) final in late August in London. "I've been beside myself for the last few days," DiDonato said Wednesday evening at Leunig's. He was talking at the start of what was sure to be a busy night — Burlington Discover Jazz Festival was in full swing — and Wednesday also was his 28th birthday. He celebrated by "working a double," DiDonato said — "jumping across town" after a day shift at Waterworks to mix drinks through the night at Leunig's upstairs lounge. No birthday present could top his win in Boston, where DiDonato had eight minutes to tell a panel of judges (including reigning MIB champ and South Burlington native Schuyler Hunton) the story behind his drink. He also demonstrated how to mix his cocktail. Tiger's Milk was inspired by a street-food dessert DiDonato ate on a trip to Thailand: sweet sticky rice with mango. His creation included a little basket he crafted from banana leaves — part of his Monday all-nighter — that DiDonato used for presenting his drink. This was his riff on the Loi Krathong Festival he saw in Chiang Mai, an annual celebration that centers on floating decorated baskets, resembling little boats, down the river. "The drink is important," DiDonato said. "But a lot of it is how you present yourself and how the drink ties into the theme of the competition." DiDonato got his start in bartending at Pizzeria Verità, where he managed the bar for a time. From there he went to Waterworks, and now works two jobs. "The only criteria is to be friendly," DiDonato said. He might have the perfect degree for a bartending gig: major in psychology, minor in marketing. Shake, then strain over crushed ice into a hurricane-style glass. Garnish with bouquet of fresh mint and an orchid flower. Shave fresh nutmeg over the top. Serve with fresh mango slices on the side.